TACLOBAN CITY – The province of Leyte is tapped to host, yet again, another national sporting event next year. This time through the National Private Schools Athletic Association Meet set April of every year. According to Leyte Governor Carlos Jericho Petilla, with the upgraded facilities of the Leyte Sports Development Center, hosting national sports gathering could become the main fare for the newly rehabilitated province-owned amenities. “I have been told the (PRISAA) board is tapping Leyte to host next year’s national PRISAA Games. This is after the sports commission and education officials have personally seen our own sports facilities here particularly the Leyte Sports Development Center,” Gov. Petilla said. Leyte would still put forward its asset for hosting the game as being strategically located and accessibility. With the province having just hosted the Palaro 2009, all the necessary facilities and accommodation for the athletes and the sports events are already in place. PRISAA is an organization of private schools all over the country with a vision to serve as a venue for sports, academic, and cultural development of the Filipino youth. It developed several outstanding athletes who represented the country in international competitions, which include renowned sprinter Mona Soliman from Mindanao and shot put and discus throw athlete Josephine dela Viña from the Visayas. The Private Schools Athletic Association is gearing up for bigger things next year as the organization plans to broaden the participation of the private school-based, multi-event meet. At least 4,000 athletes, coaches, and officials from the country’s 17 regions converge in the PRISAA National Games where the best collegiate athletes from the country’s private schools compete in various sports competitions. The PRISAAA sports events include basketball, baseball, sepak takraw, softball, football, volleyball, swimming, lawn tennis, table tennis, chess, taekwondo, karatedo, judo, badminton, dancesport and vocal solo. Last year, the PRISAA National Games was hosted by Zamboanga City and this year by Naga City. TACLOBAN CITY – More than 300 participants from the different caving clubs and speleological societies from all over the country, and cavers from Australia, United States, New Zealand, Hongkong, Great Britain and Japan have started to arrive in Tacloban ready to troop to the Sohoton Natural Bridge National Park on May 11-15, 2009 for the 9th National Caving Congress, Department of Tourism Region 8 Director Karina Rosa Tiopes informed. Tourism Secretary Ace Durano is scheduled to arrive in Tacloban to grace the Opening Ceremonies of the Caving Congress at 9:00 o’clock in the morning which will be held at the University of the Philippines Tacloban campus. After the Opening Ceremonies, the participants and guests will motor to the municipality of Basey where Secretary Durano formally launch the Eco Tourism Livelihood Project of the Sohoton Services Association and will award the financial assistance to the first six grantees of the DOT GREET Program which is one of the components of President Arroyo’s CLEEP Program aimed at mitigating the impact of the current global financial crunch. From there, the Cavers will proceed to the venue of the Caving Congress right there at the Sohoton Natural Bridge National Park. This year's Caving Congress which is being hosted by the Department of Tourism together with the local government of Basey, Samar and the Philippine Speleological Society, will differ from that of the previous year because DOT Secretary Ace Durano was keen on elevating it into something with an international flavor, Director Tiopes said. Thus, this year's speakers include Professor Elery Hamilton Smith, chairman of the International Union for the Conservation of Nature and the World Commission on Protected Areas which approves world heritage sites. Two other speakers who were invited to the Congress are Mr. Pete Chandler, owner of Spellbound Caving Tours in New Zealand; and Mr. Dave Smith of the Department of Conservation, New Zealand. They will be joined by speakers from the University of the Philippines, Department of Environment and Natural Resources, Department of Tourism, Bureau of Fisheries and Aquatic Resources, National Museum and Philippine Cave Guides Association. The National Caving Congress is an annual activity for all caving enthusiasts in the country that advocates for the implementation of RA 9072 otherwise known as the Caves and Cave Resources Conservation and Protection Act. The event will serve as an avenue to discuss issues and concerns on cave and cave resources management. It hopes to underscore the importance of conserving cave and karst resources; protecting access to caves; encourage responsible management of caves and their unique environment; and promote responsible caving. The caving congress also aims to assess and strengthen the Regional Cave Committee of the different regions in the country, to enhance caving methods and adoption of international caving standards. It also aims to orient participants on the latest issuances on caves and cave resources conservation and management and to strengthen the camaraderie between the DENR personnel and the caving community. Sohoton Natural Bridge National Park is situated at Rawis, Brgy. Guirang, Basey, Samar covering an approximate area of 840 hectares. Fascinating geological features abound in the area of the national park such as caves, hugs, limestone boulders, rockholes, weathered formation rocks and underground rivers. 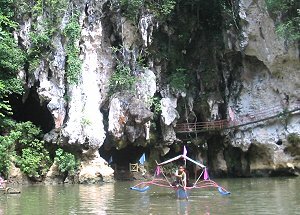 The most prominent assemblage in the park are the cathedral-like caves, which are the Panhulugan I, and II, Sohoton and Bugosan. All the caves in the park are endogen caves in angular limestone cliff, which support the base of other crack system. The Sohoton cave is a cathedral-like dome with an entrance of a parabolic arch-type for about fifty-meters high. It has a flat door area near the entrance, about twenty (20) meters in width and fifty-meters in length. On its ceiling hangs spike-shaped crystalline stalactites and rustic and cavernous walls and stalagmites on the cave's floor. At the far end of the cave are a prince-like window and a balcony overlooking the natural swimming pool below. Aside from the Sohoton Cave, the participants will also have a chance to visit the Langun-Gobingob Caves of Calbiga, Samar, the 2nd Largest in East Asia Karsts Formation. MANILA – Preserving natural sites may prove a tricky task for a vibrant tourism industry willing and able to accommodate an increasing tourism influx. For Secretary Ace Durano, however, striking the balance means continually promoting not only tourist activity, but responsible travel through dialogue, consistent training and active campaigns. This May 11-15, 2009, the Department of Tourism (DOT), through the 9th Philippine Cave Congress in the island of Samar, aims to highlight the protection of natural sites to address the issues on cave conservation and promote eco-adventures in the region. Together with the Philippine Cave Guides Association, the Cave Congress is expected to lure more than 400 spelunking enthusiasts from the United States, Canada, Europe and Asia, along with the country’s premier caving organizations. DOT firms up its stance on ecotourism and responsible travel as the Department continues to endorse projects such as the Cave Congress in Leyte. Boasting of fascinating geological features, the Sohoton Natural Bridge National Park at Basey, Samar, is filled with caves, limestone boulders, rockholes, weathered formation rocks, and underground rivers. The event will be held at the island of Samar, the third largest island in the country, and home not only to the largest cave, but also the largest karst formation in the Philippines. “Our country is known for our rich natural resources that captivate tourists of different nationalities; it is but appropriate that Filipinos develop the same awe and appreciation, for then follows the responsiveness and concern,” Undersecretary for Tourism Planning and Promotions said. Included in the list are Prof. Elery Hamilton Smith from Australia, Chairman of the International Union for the Conservation of Nature and the World Commission on Protected Areas; Dave Smith, Biodiversity program manager, New Zealand’s Department of Conservation; and Pete Chandlier, owner of one of the most successful cave tourism outfits in New Zealand. 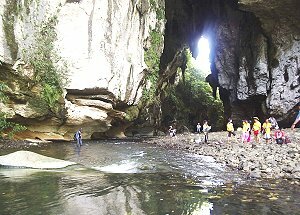 Tiopes said that the region’s caves, particularly the Sohoton National Park, are enjoying a relative good number of visitors. For the past years, Sohoton has become the top attraction of the town of Basey. In 2008, over 2,000 tourists, both local and foreign, went to the National Park for the same period. TACLOBAN CITY – The Region 8 Oplan Red Plate started its operation on Saturday May 09, 2009, on the look out for red plated vehicles which are illegally used. The office of the Ombudsman for the Visayas as lead agency in the anti-graft effort, fielded two anti-graft in the person of Engr. Roderick Blazo and Elmer Gutierrez, together with the members of the Philippine National Police (PNP), Land Transportation Office (LTO) and the Philippine Information Agency (PIA), armed with data capturing machine to know the real identity of the government owned vehicle and to established substantial evidence that will support filing of necessary actions for their misdemeanor. The Task Force Oplan Red Plate formed two teams. Team-A lead by Anti-Graft Investigator Engr. Roderick Blazo which operated within the downtown area going to Babatngon, Leyte was able to document 34 government vehicles being used without corresponding trip tickets to show whether they are being used on official business. The Oplan Red Plate team A informed that one government vehicle was driven by the son of a government official who is not a government employee and not the authorized driver of the vehicle. Others apprehended were used for shopping while others were used in attending fiesta as it was learned that May 9 is the fiesta in Babatngon, Leyte. Team-B, on the other hand which was lead by Elmer Gutierrez, Anti-Graft Investigator, operated within downtown area going to Tolosa, Leyte and was able to document 37 government vehicles used without trip ticket. One government owned vehicle was being used in the procurement of construction materials in downtown area Tacloban City when the task force spotted it. The vehicle was accompanied by a barangay councilor in one of the local government units in Leyte and the vehicle was bearing an expired registration. Other government vehicles spotted by Team B were being used for shopping and for attending the fiesta in Tolosa, Leyte. It was also known from the two anti-graft investigators, Engr. Roderick Blaza and Elmer Gutierrez from the office of the Ombudsman for the Visayas that while traveling from Ormoc City going to Tacloban City to lead in the first surprise operation of the task force in Region 8, they documented fourteen traveling government vehicles. Anti-graft Investigator Guttierrez said that the 85 government vehicles which were spotted and documented by the Oplan Red Plate Task Force will be subjected to verification and upon completion of the necessary documents, the Office of the Ombudsman Visayas will write the respondent officials, drivers and passengers to show cause why the government owned vehicle memorandum receipted to them was used without corresponding trip tickets and not used for official business, only as a matter of due process. After the respondent answers, the Office of the Ombudsman Visayas will form a fact-finding team which will determine if there is probable cause that will warrant the filing of a criminal and administrative case. Gutierrez further informed that the respondent is not allowed to file motion to dismiss as a mode of dilatory tactics but they should answer within the reglamentary period as determined by the investigator. It will be very hard for the respondent to make an alibi for this case because the government vehicle has been spotted and properly documented according to the acts committed, said Gutierrez. The public who witnessed the operation showed support for they will now see that their tax will not be wasted anymore by few corrupt officials in the government service. PASAY CITY – Senator Chiz Escudero on Friday said the Senate has approved on third reading a measure that would strike out vagrancy in the list of petty offenses in our criminal code. Escudero said Senate Bill 1965 seeks to amend Article 202 of the Revised Penal Code, which penalizes vagrancy and prostitution. It removes the term vagrancy and its description in the law which imposes a jail sentence of one day to 30 days or a fine not exceeding 200 pesos. “Today’s vagrants are mostly victims of circumstance and the inequities in society. Our laws must march in step with times. It is time to strike out this anti-poor provision from our code of crimes,” he said. Escudero said SB 1965, which is a consolidation of bills filed by him and two other senators, was approved by the Committees on Justice and Human Rights and on Constitutional Amendments, Revision of Codes and Laws. The senator, who chairs both committees, said if the bill becomes law, it would also decongest court dockets and allow law enforcement officers to pay more attention to graver offenses, thereby improving the administration of justice in the country. “It also seeks to give a more humane countenance on our justice system, which prioritizes the rehabilitation of the offender and acknowledges the value of every human life,” he said. CATARMAN, Northern Samar – The province of Northern Samar became the first province to inaugurate the Citizens' Charter during the Cutting of the “Red Tape” program which was held Thursday at Ibabao Hall, Capitol Building, Catarman, Northern Samar. The inauguration was led by Assistant Commissioner Anicia M. De Lima of the Civil Service Commission. In her keynote address, De Lima said that the Citizens' Charter is an official document, a service standard, or a pledge that communicates, in simple terms, information on the services provided by the government to its citizens. It describes the step by step procedure for availing a particular service, and the guaranteed performance level that clients may expect for that service. Moreover she said that the head office or the agency shall be primarily responsible for the implementation of this Act and shall be held accountable to the public in rendering fast, efficient, convenient and reliable service. All transactions and processes are deemed to have been made with the permission or clearance from the highest authority having jurisdiction over the government office or agency concerned. After compliance with the substantive and procedural due process, those who violate the law may be found guilty of a light or grave offense with penalties ranging from thirty days suspension without pay and mandatory attendance in the Value Orientation Program; up to dismissal and perpetual disqualification from public service. During the program, Governor Raul A. Daza was awarded a Plaque of Commendation for being the first province in region 8 to have drafted, crafted and inaugurated its Citizens' Charter pursuant to the mandate of Republic Act. No. 9486 otherwise known as the Anti-Red Tape Act of 2007. The province then became a showcase in Eastern Visayas Region that demonstrated a high sense of dedication and commitment to uphold the standards of service delivery to the people of Northern Samar which serves as an inspiration to other agencies. The award was given by no less than the CSC Assistant Commissioner Anicia M. De Lima. Also present were CSC Region 8 Regional Director David E. Cabanag, Director Marilyn Taldo, Samar CSC Director Michael M. Dela Cruz, Northern Samar, CSC Director Rey Albert Uy and OIC Director Emmanuel Fuentes of Eastern Samar. The top 24 services of the Citizen’s Charter of the province have been identified as follows: the Equipment Support Services; Technical Assistance to LGU’s, NGAs and other PGNS office; Processing of Tax Declaration for updating, review and approval by the Provincial Assessor/Asst. Provincial Assessor; Issuance of Certification of Landholdings/No landholding and certified true copy of tax declarations; relief distribution; augmentation services for food for school program 4Ps/KALAHI CIDSS/CWC 7 other National Projects; Social Protection; Provincial Education Assistance Program (PEAP); Provision of Farm Machineries; Provide Technical Assistance on Crop Fisheries, Livestock Production and Farm Mechanization; Animal Treatment Vaccination/Deworming; Cattle/ Swine Dispersal; Fishery Quarantine Services; Render Legal Opinion; Issuance of Certification of Employment; Issuance of Service Record; Authentication of Documents; Emergency Room Laboratory Request; Visitors Guests Safety and Security; Processing of Purchase Request & Procurement Reimbursement; Social Amelioration Program; Receipt of Municipal Ordinances and Resolutions for review; Issuance of designation and detail orders; Getting a copy of Annual Accomplishment Report, Municipal Profiles, Project Status Report, Technical Assistance to LGU, NGA, and other PGNS Offices. TACLOBAN CITY – A pedicab driver and his son shed tears upon being told that the son is among the first set of President Gloria Macapagal-Arroyo’s “One Town One Scholar” Program. 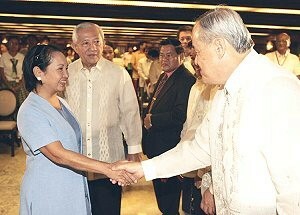 President Arroyo shakes hands with Mayor Roque Tiu of Tanauan, Leyte, during the ceremonial awarding of the scholarship certificates for some 1,500 One Town One Scholar Program for 2009-2010. “I was anxious when a neighbor told me last night that my son Argie and I are being requested by the Mayor to see him at 8:00 o’clock in the morning today,” Mr. Mabag, a pedicab driver from Cabuynan, Tanauan, Leyte, said. At exactly 8:00 o’clock in the morning, Mr. Mabag and his son Argie were at Mayor Roque Tiu’s office. Mayor Tiu then told the father and son that Argie’s application to be a “One Town One Scholar” has been approved by CHED and that the Mayor will accompany him to Manila to receive the scholarship certificate from no less than President Gloria Macapagal-Arroyo at the Malacanang Palace. “I was shocked and at the same time surprised to see they shed tears,” Mayor Tiu said confiding that he was taken aback at the reaction of the father and son. He said that CHED Region 8 called him up early evening of Monday informing him that Tanauan’s “One Town One Scholar” will represent Region 8 in the awarding of scholarship certificates at Malacanang on Wednesday, May 6. “I never expected to be able to pursue a college education,” Argie said. “Thanks to President Gloria, my dream to become a professional so that I could help improve the economic standing of my family will be realized,” Argie said crying. Argie said he learned about the “One Town One Scholar” program of President Arroyo from Mayor Tiu during the graduation exercises last March. As a PGMA’s “One Town One Scholar” grantee, Argie will receive a scholarship for a four or five year college degree program, including free tuition and transportation and living allowances, not exceeding P15,000 per semester for School Year 2009-2010 and every year thereafter. 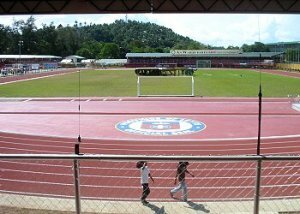 TACLOBAN CITY – After the successful hosting of the Palarong Pambansa 2009, Leyte is now being eyed as the venue of the next Private Schools Athletic Association or PRISAA National Games. The 2010 National PRISAA Games venue? This was disclosed by Leyte Governor Carlos Jericho Petilla during the Appreciation Program for the 2009 Palarong Pambansa Executive and Working Committees. Governor Petilla said that he was informed about the choice of Leyte as the venue of the PRISAA national games, this time even without the Province bidding for the hosting. Dr. Edward Chua of Asian Development Foundation College confirmed that the Leyte Sports Development Center in the province of Leyte will be the venue of the next Annual PRISAA National Games or in the Annual CHED National Palaro. This is a happy note that people are starting to realize the value of the modernized Leyte Sports Development Center. The private sector agrees that the hosting of the Palaro at the LSDC indeed brought in tourists to the Region and provided good business to the local investors. In fact, many local investors are predicting that Leyte will become the athletic destination. Be that as it may, Governor Petilla is determined to make full use of the new facilities to develop good athletes not only for Leyte but for the entire Region 8. In related note, the National Convention of the Philippine Dental Society is scheduled to be held at the MacArthur Park Beach Resort at Palo, Leyte on May 16. TACLOBAN CITY – The royalty shares of the local government units where the sources of the geothermal power generation have been determined and will soon be released, President Gloria Macapagal-Arroyo announced on April 28, during the one on one regional media interview after the groundbreaking of the new airport terminal building, a component of the Tacloban Airport Development Project. The President then acknowledged Budget and Management Secretary Rolando Andaya saying that the DBM has computed royalty tax shares which will be released to the host local government units. The province of Leyte will receive P4,101,338 for 2007 and P17,616,006.80 for the year 2008. Barangay Tongonan and Barangay Tongonan/Lake Danao will receive P1,177,978 and P1,114, 203 for 2007 while for 2008, the amount of 9,209,651 and 1,251,201 will be released. President Arroyo said that the delay in the release of the royalty shares to geothermal host LGUs surfaced after the then Philippine National Oil Company-Energy Development Corporation was formally privatized. Prior to this, the then PNOC-EDC had remitted the royalty tax shares directly to the host LGUs but after its privatization, the same have to be coursed through several government agencies. 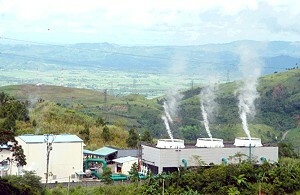 To recall, President Arroyo had earlier ordered the Department of Energy (DoE), Department of Budget and Management (DBM), Department of Finance (DoF) and the Department of Interior and Local Government work on the computation of the royalty shares and have these released at the soonest possible time to the LGUs that play host to the country’s geothermal power plants. TACLOBAN CITY – Bent on helping former rebels go back to mainstream society and live as peaceful and productive citizens, the government through the Office of the Presidential Adviser on the Peace Process (OPAPP) and the Office of the Governor of Leyte awarded socio economic assistance to 109 former rebels from the hinterland municipalities of Mahaplag, Inopacan, Hindang, Hilongos, Matalom, Jaro, Lapaz, Dagami and Burauen, all in the province of Leyte. The 109 former rebels have been reintegrated into the mainstream society before the Social Integration Program of the Arroyo Administration was created on March 23, 2007, but they are still entitled to government assistance, 1Lt. Noli de Lago, information officer of the 19th Infantry Battalion of the 8th Infantry Division, said. During the awarding of socio economic assistance held on April 29, 2009 at the Hilongos Gym in Hilongos, Leyte, each of the 109 former rebels received P20,000 cash assistance from President Arroyo thru the OPAPP and P10,000 worth of assorted grocery items from Governor Carlos Jericho Petilla and the Provincial Government of Leyte. The awarding of socio economic assistance is a manifestation of the sincerity of the leadership of the government in pursuing peace thru the implementation of reconciliation, reintegration into mainstream society, and rehabilitation programs. Aside from the cash assistance, the government have facilitated the conduct of a series of lectures regarding entrepreneurship and introduction to organic farming, hog raising, goat dispersal, cattle management and technical education and skills, by the office of the Leyte Provincial Agriculturist, the Department of Agrarian Reform and TESDA, in preparation for the rebel returnees’ going back to the mainstream society. The awarding was attended by OPAPP Undersecretary Pundato Dimasangkay, former Baybay Mayor Jose Carlos L. Cari who is the chairman of Leyte Social Integration Committee and who is representing Governor Petilla, Board Member Rolando Piamonte Sr. Vice chairman of LSIC, Hilongos Mayor Panfilo Go, Mrs. Clotilde Malatbalat who is the Leyte Provincial Social Welfare and Development Officer, Ms. Gwyndolyn Malate, Leyte Social Worker, Col. Allan Martin who is the Deputy Brigade Commander of the 802 Brigade and Lt. Col. Roberto S. Capulong, commanding officer of the 19th Infantry Battalion. In line with its inherent function, the 19th Infantry Battalion under Lt. Col. Roberto S. Capulong, plays a vital role in the newly created Leyte Social Integration Committee under the National Committee on Social Integration of OPAPP pursuant to Administrative Order No. 172, in attaining a common goal of ensuring the efficient implementation of Leyte Social Integration Plan in pursuit of a peaceful and developed province of Leyte.